Selfwinding chronograph with hour, minute, date display and small seconds at 6 o'clock. 41 MM stainless steel case, glareproofed sapphire crystal, screw-locked crown, silvered "Panda" dial with “Grande Tapisserie” pattern, black counters and extern zone, white gold applied hour-markers and Royal Oak hands with luminescent coating, stainless steel bracelet. 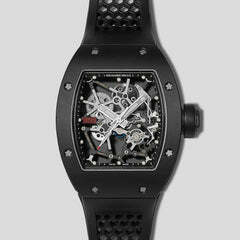 Water resistant to 50 meters with a power reserve of 40-hours. This particular example is in mint like-new condition. The timepiece also comes complete with all accompanying boxes, manuals, and Audemars Piguet papers dated 2017. 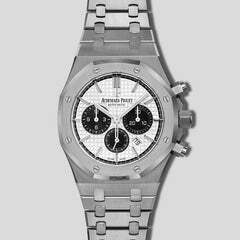 The majority of the Audemars Piguet warranty remains on this timepiece.